Vacuum clean to get rid of dust, crumbs, or other loose dirt particles from your seats. Use a soft brush attachment with the vacuum to prevent scratching the surface of your seats. Spray a lint-free microfiber towel with any mild leather detergent, saddle soap or leather cleaner and wipe the suds around your seats, avoiding saturation. This removes surface dirt further, even urine if any. To deep clean, spray some cleaner directly onto your seats. If you have perforated seats, spray the cleaner onto the brush instead of the seats. Then, with a soft-bristled brush scrub gently. 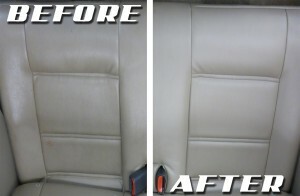 Spray the seats with clean, warm water. Wipe off with a clean and dry microfiber cloth. Leave to dry by allowing in air and sunlight. You can clean your seats lightly every month without deep cleaning them. However, try to do the entire process at least four times every year. If you observe grime building up or have white or any light colored seats, repeat more frequently. If you are wary about using commercial leather cleaners, make a natural one yourself by mixing 2 parts linseed or olive oil with 1 part white vinegar. For a beautiful smell, you can add 2-3 drops of eucalyptus or your favorite essential oil. If you do not have the soaps mentioned above, just mix 1 part Woolite to 10 parts water to clean and condition the seats. For the application, follow the instructions on the product. Never over-condition as the excess just sits on top making the seats greasy. For perforated seats, select a conditioner that does not dry white. Never apply the conditioner directly to the seats. Sparingly apply to an applicator such as a microfiber cloth or a sponge and gently massage into the leather. After application, park your car in the shade, away from the bombardment of UV rays. Usually, conditioners require an hour of sitting time. If you are a stickler for organic home remedies, follow the below DIY after cleaning. Take a die-free, clean, dry cloth and add around 10 ml of coconut oil. Spot test on a tiny area of the seat. If it’s ok, rub the leather gently all over. For extra-grimy leather, you can use a vapor steamer with a triangular brush attachment. Don’t go overboard with too much pressure or heat. Just 15 seconds of steam should get the job done. Use a microfiber towel between the brush bristles and the seats for a gentle scrubbing effect. Once cleaned, wipe off with a clean, dry microfiber towel. Follow up with a good leather conditioner. Do not use baby wipes for cleaning as they may contain chemicals harmful to leather. Use of Dawn dish soap should be prevented as it is too abrasive for leather. Avoid using furniture polish, gloss, ammonia, wax, petroleum distillates and silicone for cleaning purposes. Never allow water to stay long on leather. Allow proper drying to prevent discoloration. A proper maintenance of expensive leather seats will protect them from cracking adding aesthetic value to the interiors of your car. This collection of simple homemade recipes should take care of major issues.